Being festive season, there is always a need to prepare a sweet on every occasion. And for a few festivals, including puran poli in the menu is a must. 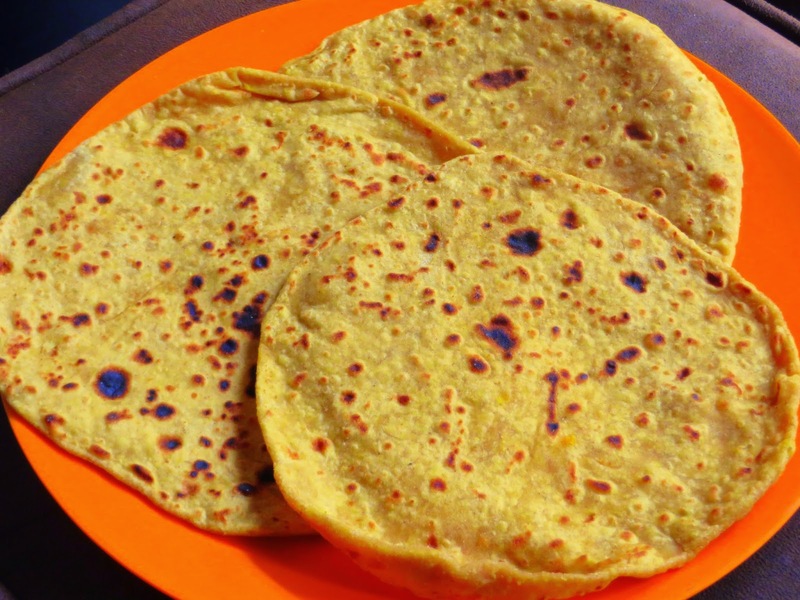 The traditional puran poli otherwise called as obbattu, holige, babbatlu or boli is prepared using jaggery with either channa dal or grated coconut or in combination of both. There are numerous ways to prepare these polis. Adding a twist to the traditional method of making puran poli, and trying to make it more healthy, I came up with the idea of using sweet potato as the main ingredient for the puran. In this recipe, I have mashed the boiled sweet potatoes, mixed it with jaggery (not white sugar) and flavoured it with nutmeg and cooked until the puran consistency is reached. I have also used regular chapathi atta and not maida or all purpose flour for preparing the poli. A touch of ghee gives it an added flavour. Avoid ghee for a vegan version. This is a recipe for diet conscious people, a recipe for the sweet potato/genusu lovers and a recipe for people who want to try something new. You can customize this recipe for flavours and for preferred sweetness. Here's the recipe. Ingredients for 10 puran polis. Boil the sweet potatoes. I pressure cooked it for 6 whistles to overcook it so it can be mashed well with no lumps. Transfer the cooked sweet potatoes to a non stick kadai after peeling off the skin. Mash well to avoid lumps. Add the grated jaggery and mix well and cook in medium heat and if needed add half cup water to kick start the jaggery to melt. Cook for at least 15 mins or until the puran consistency is reached. For checking the consistency, please see the note below. Now add the nutmeg powder ( cardamom and saffron too if you are using them) and mix well. Adding ghee at this point is optional. Let the content cool. Make lemon sized balls and keep is aside. Puran is ready. How to check if puran consistency is reached?? Keep stirring the puran. You will notice that the content liquefies after jaggery melts and then slowly the content thickens as the water is evaporated/absorbed. At this point in time, turn off heat and take a teaspoon of the puran and cool it. Try to make a ball out of it. If the puran is still sticky and is difficult to roll it to a ball, the puran needs a little more cooking. When the puran is cooling down, prepare the dough. In a mixing bowl, add the atta, salt, turmeric powder and oil. mix well. Now add water little by little and using the tip of your fingers, keep mixing the flour. Knead it to a soft, pliable dough. Make lemon sized balls and keep it aside. Like regular stuffed parathas, the puran is stuffed inside and rolled, then cooked on both sides dabbing ghee. Roll a ball of dough. Dredge it with flour. You can use your fingers and palms alternatively to make it cup shaped to place the puran in the middle. Place the puran in the center and close the puran on all sides with the rolled dough. Press on top. Try to avoid air pockets while sealing the puran inside. Make a ball and Keep it aside. Repeat until all the puran is used. For detailed step by step procedure please click here. Using flour scarcely for dredging, roll out the stuffed dough to a regular paratha size. Make sure the surface is even. Roll to medium thickness. Repeat for all the poli. Heat a non stick tawa. Place one rolled poli. When you see small bumps on the surface, dab with a teaspoon of ghee/clarified butter or alternatively oil for the vegan version. Flip the poli and cook the other side dabbing ghee. Cook both sides until you see small brown spots. Transfer it to the serving plate. Repeat the process until all of the poli is cooked. Enjoy this sweet delicacy and finish it the same day as they don't keep well even if it is refrigerated. Sweet potato is full of goodness and enjoy this delight guilt free.